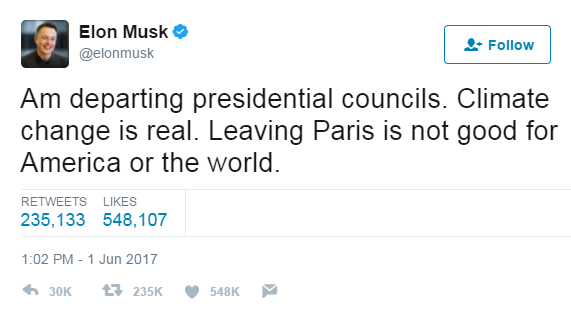 After weeks of speculation, on Thursday, June 1st, 2017, President Donald J. Trump publicly announced the United States withdrawal from the Paris Agreement. To many Financial Advisors with a passion or special focus on Impact Investing, ESG (Environmental Social Governance) Issues, or SRII (Socially Responsible Impact Investing), a withdrawal was something that had the potential to setback their progress, but is it possible that it had the opposite effect? The Obama Administration championed the Paris Accord, or Paris Climate Act, which was signed by 195 countries in 2015 with the goal to lower greenhouse gas emissions and fight climate change. President Trump has been a vocal opponent of the Accord and a widely known non-believer in climate change. The United States is the second highest polluting country in the world and under the previous administration had pledged to cut emissions by 26 - 28%, by the year 2025 and is already down 12% from 2005 emissions. Prior to the June 1st announcement, many Impact Investing-focused Financial Advisors were in favor of the United States remaining in the Paris Accord thinking that a withdrawal could mean a huge setback for their Impact/ESG/SRII focused practices. Both Tesla and Disney, for example, are companies with strong public support of environmental causes and innovation, and their reactions speak volumes. However, we believe that through this announcement, the Impact movement has actually gained awareness. We have seen an increase in client interest in Impactful products and projects. The withdrawal may have inspired an increased desire for climate conscious investors to vote with their dollar by investing in companies that mirror their own ESG values. We suggest to Financial Advisors who are not as well versed in Impact Investing, to brush up on some strategies as we foresee this desire of clients to vote with their dollars will only increase as awareness increases. Feel like you need to learn more about Impact Investing? Go educate yourself on Impact U!